Some of you may be at a time in life when you feel unsettled and have begun to ask yourself serious questions like: “Why am I doing what I’m doing?” or “Is this how I want to spend the rest of my life?” You feel stuck. You know it’s time for a change but you don’t know how to approach it. For others of you, a major change is around the corner and you’ve been thinking: “I don’t know what I’m going to do; how do I leave the career that I’ve built and still feel like I matter?” You don't want to feel like you are about to fall into a black hole. You want to stay relevant, significant and connected. In order to be meaningful, defining the purpose for your next phase is key. Defining your purpose will unlock the door to the fulfilling life you want. This is how you ensure change is going to work for you. Understanding your life’s great meaning on the other side of change can give you peace of mind because you know what your focus in life is. 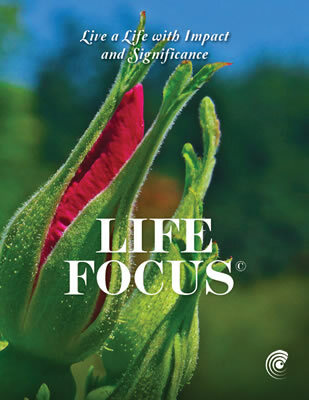 Click here to take the Life Focus Assessment to find out where you are in the search for your meaning in life. When you go about your individual life, it can become harder and harder to stay connected with your spouse or growing family. While responding to life’s increasing demands you no longer find the time to think and evaluate what’s good for you. People find that they become more and more distant from each other. That is why in a life filled with obligations and distractions, it is important to find a way to reconnect with your spouse. How do you do this? By sharing the core of who you are with your spouse; by listening to them express and describe the core of who they are; by supporting each other’s strength and values to bring meaning into your family’s life, not as a directive but as a discovery. When you do this, you build a powerful foundation for a harmonious and significant life with your partner based on shared and understood values, individually and together. Click here to take the Life Focus Assessment and see what is keeping you from having the supportive relationship that you want. A sense of purpose is key to a happy retirement. Without purpose in retirement, you may feel that you are irrelevant, insignificant and not needed - you do not want that. You will also find that a bucket list will only take you so far. Golfing four days a week with your friends will only give you so much. It will not provide the meaning you want for your life. You may know people who have retired without a sound plan to uncover the meaning in this phase of their life. After their preliminary “vacation period” was over, they lost interest in their life and they slowly retreated from their favorite activities. Eventually their health deteriorated and they found themseleves isolated and alone. You do not want that for yourself! If you can not visualize your significance in retirement, the thought of retirement is unsettling. You do not want to retire. You do not want to leave behind a world where you have responsibility, purpose and a sense of duty. How can you continue to have the same sense of relevance somewhere else? Instead of seeing retirement as a mindless time-sink, you have to look at it as your opportunity to build something even greater for yourself. Here at Focus and Sustain we have helped many people transition from a world of relevance, comfort and significance at work, to one as meaningful, at home. We have helped people like you transform the fear of becoming isolated and rudderless to a feeling of being connected and purpose-driven. People from all walks of life have defined their retirement and found their life more fulfilling. You can too! Click here and take the Life Focus Assessment to figure out what are the chances now for your retirement to be fulfilling and satisfying. If you feel stuck and/or are contemplating a big change, you need to know you can build the next chapter of your life the way you want it. You will continue to live a rich life with a strong footprint. We have the tools you can use to find the joy of living in your next chapter of your life by connecting to your new found purpose and significance. Our Life Focus programs are designed to help you build a life that matters to you and your family. We understand that your situation is unique and may not perfectly align with the topics above. We customize our approach to meet your specific needs and objectives. In our initial conversations with you we will determine, together, what your priorities are and the best course of action to take. You do not have to live with the frustration of a life unfulfilled. You do not have to be paralyzed by the fear of an unknown or dreaded future. We can help as we have helped so many people just like you. "We came into the Life Focus program because we realized that although we’ve had over 35 years of marriage we still had major points of contention in our relationship… The transformation we’ve gone through together has put our daily lives on a slightly different track. We are now very comfortable and are aligned on the important stuff. We are now having a good life together. We now have peace of mind and less stress in our relationship. We are also more apt to speak up and honor what the other has done. This has strengthened our connection with one another." "You guided us to be able to have a look at our own lives in the long term. We became more aware of and put purpose to our retirement, together and independently. Instead of being apprehensive to spending so much time together again, our communication and connection is supportive. We have a framework for our lives both individually and together." If you have not done so yet, click here to take the Life Focus Assessment to find out where you are in your journey to the meaningful life you want. We look forward to you joining the ranks of successful people who found their purpose on the other side of change. We want you to experience the joy and pride of having designed your own life according to what is most important to you.